Loyal Ricks Jr Is a twenty year-old sophomore from the first state of Delaware. 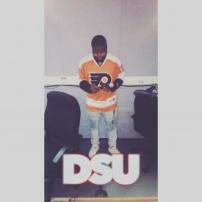 He currently attends Delaware State University, majoring in Mass Communications with a concentration in television, radio and film. Loyal is also apart of Delaware State's radio station , WDSU The Hive. He co-hosts and acts as the disc jockey for " The Lituation Radio Show." I am a lover of music and sports! NBA: Who won the Cleveland and Boston trade? Will Injuries and tribulations keep the Cowboys from making the playoffs? NFL: Who are the top five teams in the NFL after week nine? NBA: Can the Philadelphia 76ers make the the playoffs? NFL: Can the Panthers continue to rely on Cam Newton? Can the Kansas City Chiefs remain undefeated? NFL: Can the Miami Dolphins gain a slight advantage over the Patriots? NFL: Will the Patriots be able to conquer the AFC Conference? NBA: Can the Philadelphia 76ers reach the NBA Playoffs? NBA: Can the Thunder make a NBA Championship run with new offseason signings?